If cancelled or modified up to 10 days before date of arrival, a fixed amount of USD 25 will be charged. ›› If cancelled or modified later or in case of no-show, 100 percent of the first night will be charged. Thirty (30) days for Americade, Firemen's Convention, Adirondack Nationals Car Show reservations. ›› Reservations must be guaranteed with a valid credit card or by check or money order (subject to collection) for a deposit in the amount of one night's room charge, plus applicable taxes. ›› A reservation guarantees that Pinebrook Motel will hold your room as reserved . ›› pinebrook Motel gladly honors its reservations, and we therefore require that you honor your commitment in return for the full period reserved. ›› No refunds are given for early departure. No reservations may be assigned or sublet . ›› Friday and Saturday nights are an additional $10 per night. ›› Rates based on double occupancy. Each additional person above 12 is $12/night. ›› Special Events & Holiday Weekends rates may be higher and a 2 or 3-day minimum may apply. ›› All rates subject to 7% NYS Sales Tax plus 4% Occupancy Tax. ›› We are not responsible for errors in this rate schedule. ›› The balance is to be paid upon arrival. ›› Rates may be subject to change without a confirmed reservation. ›› Advance notice needed for cots and they are $12 each per night. ›› Parking: Limited to one (1) vehicle per unit . Please request permission to park additional vehicles. Management will try to accommodate you, but cannot guarantee that space will be available. ›› Prohibited Activities: Sorry, no bicycling, rollerblading, skateboarding, scootering or the like is permitted on our property. ›› Pets: Sorry, guests are not permitted to bring pets on the property. ›› Non-Smoking Policy: pinbrook Motel does not permit smoking in the interior of any motel room. 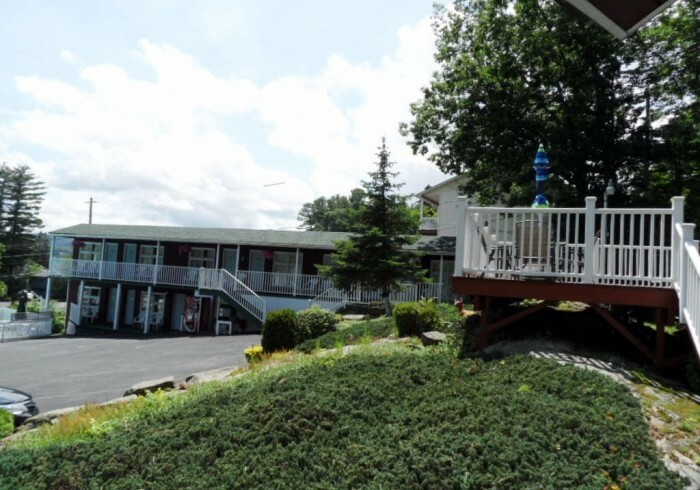 Only registered guests of pinebrook Motel are permitted on our property.